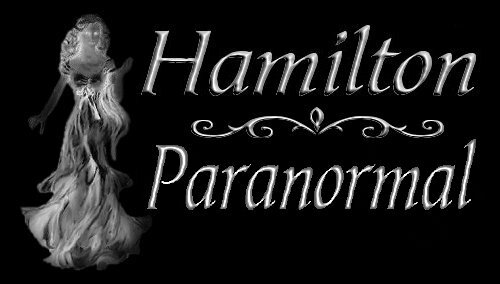 Hamilton Paranormal - Smoke & Mirrors? We have been accused, in the past, of being nothing more than a bunch of people that claim to be paranormal investigators, and we show nothing more than "Smoke and Mirrors" on our site. 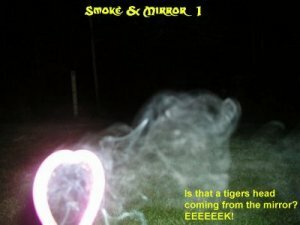 The above photos are nothing of a paranormal nature, (in our opinion only) except for those folks that believe all we have got is "Smoke and Mirrors" throughout our site. 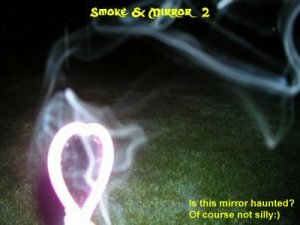 The truth is, the above pictures were done to show beyond any doubt what a smoke and mirror picture really looks like. We got a good chuckle out of this and we thought you would too. Now, with that out of the way, everyone as well as us knows that any picture posted on our site or another site is subject to criticism, do you agree? We cannot make believers out of everyone, nor do we try to. With each post of something of the paranormal, there is a statement before the pictures are posted saying, this is "our opinion only" Have you seen these statements on our investigation pages? In our opinion only, as stated on many investigations we have conducted, I do give what I see in the photo. Now some may see different things in the photo and they can form their own opinion. Some will think that it is only cigarette smoke , fog, breath etc.... That is the person's right to believe what they want. History, as you know, is important to the world of the paranormal. And our research has only strengthened our opinion about why paranormal activity would occur at these locations. Its your god given right to believe or not believe what we've got on our site. This comes down to a personal choice. I am not here to start up a cult of the paranormal. As to ones belief of what we have here on our site, it is your opinion only. Some will agree with you while others will disagree, so you are no further ahead than we are. You could almost say this makes the both of us a 50/50 deal so to speak. So tell me, who wins????????? What did we accomplish at the end of the day?